Apple iOS Bug: Why is the hyperlink to my digital card not active? 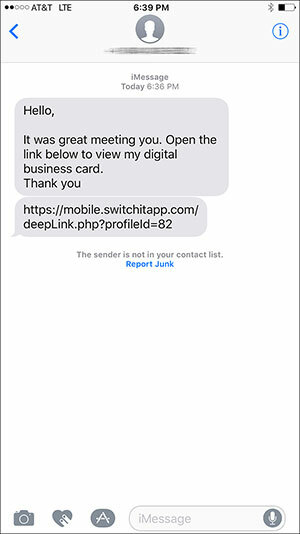 Apple iOS Bug: Why is the Hyperlink to My Digital Card Not Active in SMS Messages? If you are experiencing problems with the hyperlink of your digital card not being active in the SMS message when you share your card with others, it is due to a bug in Apple iOS. We have reached out to Apple regarding this issue but have not received a reply as to when the bug will be fixed. In the interim, we have provided a working solution to mitigate the problem until Apple addresses the bug. So what’s the Apple iOS bug? The text message is sent from either a long code or short code, and there are no previous messages stored on that user’s mobile phone from that long code or short code. Either that long code or short code hasn’t text messaged that user ever before, or the user has deleted the previous text messages from that long code or short code off their mobile phone. The user when they receive the text message is already within another existing text message conversation. This can either mean the user is looking at another conversation or engaging in another conversation. Then instead of exiting out of the existing text message conversation, and opening the new text message, the user clicks the pop-up that appears after receiving the new text message, that then immediately takes them to the text message they just received. Our Solution and How It Affects Switchit Users. It was great meeting you. Click the link below to view my digital business card. If you are unable to click on the link, reply RESEND. 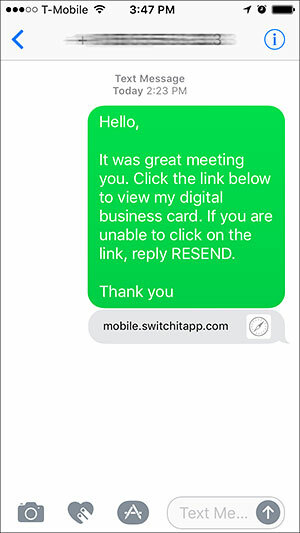 If the person you share your digital card with replies back to you, via SMS text message, with RESEND – simply resend him or her your digital business card to establish a connection. *IMPORTANT* You must have the recipient send you an SMS text message or call your phone in order to establish a connection with your device. Also, you can have the person simply copy & paste the link into their browser. We know this may be a pain, however, until Apple fixes the bug this is the workaround solution our team has developed to make the sharing process work. We apologize for any inconvenience and we will continue looking for fixes, on our end, until Apple addresses the bug. If you have questions, feel free to email our support team at team@switchitapp.com. We are glad to answer any questions you may have.